The Old Rectory01873 821326work Guest HouseThe Old Rectory stands in an acre of mature gardens, in the unspoilt rural village of Llangattock-Lingoed, adjacent to the renowned Offa's Dyke Path. The Rectory has a productive kitchen garden allowing home grown produce to be served. The Brecon Beacons and Black Mountain ranges, Llanthony Priory, Tintern Abbey. White Castle and other castles at Grosmont and Skenfrith, Abergavanny Museum. The Old Rectory stands in an acre of mature gardens, in the unspoilt rural village of Llangattock-Lingoed, adjacent to the renowned Offa's Dyke Path. The Rectory has a productive kitchen garden allowing home grown produce to be served. The 'Big Pit' - a unique opportunity to take an underground tour of a real working coalmine. Try some watersports or just enjoy the views at picturesque Llangorse Lake. 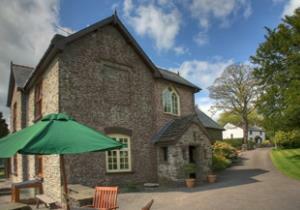 The Rectory has the historic market towns of Abergavenny (6 miles) and Monmouth (13 miles) relatively close by. property situated on the famous offas Dyke Path and 3 castles Walk Children welcome from any age.